The first cohort of ACTS Ph.D. programme began their studies in May 2017. Announcements about future intakes of students will be posted on this page. The Applied Conflict Transformation Studies (ACTS) Ph.D. Programme is designed to build upon Asian peace practitioners’ existing knowledge and skills, and enhance them through intensive and reflective study. 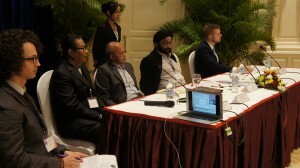 One of the long-term goals of the ACTS vision is to contribute to the development and dissemination of Asian peace perspectives and approaches. The programme utilizes a curriculum and pedagogy specifically designed to bring together theory and practice. Upon completion of this programme, the students will have developed a deeper and more comprehensive understanding of the field of Conflict Transformation and its practices and be able to conduct new research in both the realm of practice and theory. As a whole, the programme will contribute to the total number of excellent practitioner/ scholars in the Asia region, and articulate a more nuanced understanding of Asian conflict contexts and approaches to Conflict Transformation. The ACTS Ph.D. Programme is delivered in collaboration with Paññāsāstra University of Cambodia (PUC). It builds on the 10 years of collaboration between CPCS and PUC on the ACTS Master’s Programme. It represents the fusion of PUC’s commitment to building a nonviolent future for both Cambodia and the region with the vision of the Center for Peace and Conflict Studies (CPCS) of fostering sustainable peace through strategic interventions into violent conflicts in Asia.